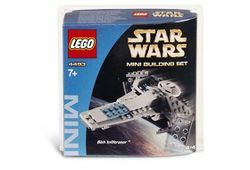 4493 Mini Sith Infiltrator is a Star Wars Mini set released in 2004. It is Darth Maul's personal starship, the Scimitar, also called Sith Infiltrator. It was the first and only miniature model of Darth Maul's starship released, and also a minikit set in LEGO Star Wars: The Video Game and LEGO Star Wars: The Complete Saga. The set is mainly made up of light stone grey and sand blue pieces. The base of the ship is a large wing. At the front of the ship is a 2x4 tile with a flat 2x6 sand blue piece, and another 2x4 tile, and a 2x4 sloped brick after that. Behind the sloped brick are two 1x2 sloped bricks. Behind the sloped bricks is the cockpit, and the top of the cockpit is a dish with a Sith printing on it. To the left and right of the ship are the dark stone grey wings. Each side has two wings, one rightside-up, and the other upside-down. They are also tilted and can be moved up and down. The Sith Infiltrator, or Scimitar is a prototype stealth ship that was first used prior to the Invasion of Naboo. Darth Maul landed on Tatooine and sent Probe Droids to scout for Queen Amidala, who escaped Naboo and was assigned to find by his master along with her Jedi guards Qui-Gon Jinn and Obi-Wan Kenobi. He later found them, but failed at his mission, as Qui-Gon Jinn narrowly escaped. Part:3960px15 is exclusive to this set. This is a description taken from LEGO.com. Please do not modify it. Beware the Sith Infiltrator! Build a detailed MINI replica of Darth Maul's feared craft, the Sith Infiltrator, from Star Wars: Episode I The Phantom Menace! Facts about "4493 Mini Sith Infiltrator"
ShopDescription Beware the Sith Infiltrator! This page was last edited on 9 January 2016, at 17:59.